Any pros out there with autocad map? I have a shape file with data (assessor numbers), I'd like to import only parcels that start with the first 5 digits I input. Anyone know if this is possible? What I can determine so far is I have to import the entire thing, then I can go from there. This can be done with AutoCAD map but it can also be done with the free software QGIS. I use both but I find QGIS has better features for some tasks. It is a great tool definitely worth the minimal effort to download, install and try. 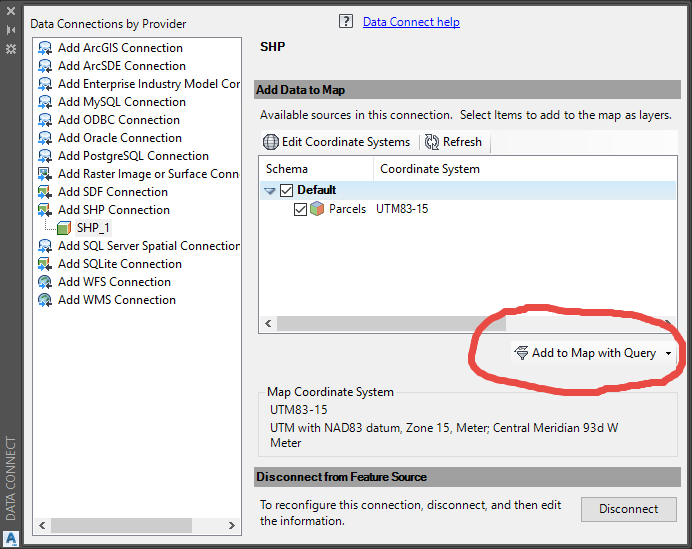 In the drop down that normally says "Add to Map", click the down arrow and choose "Add to Map with Query"
It will open up another dialog where you can filter the data by almost any field and value. as RK is showing you will want to create a query to limit what is import from the shp file. or it might be simpler to use a location polygon to limit the data to a particular area....if that meets your needs.